Plain yellow vinyl for converting coaches into Network Rail vehicles. 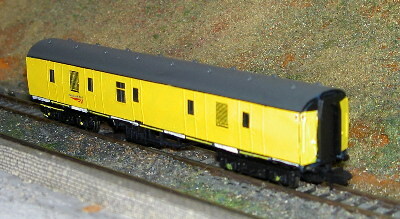 The plain vinyl allows a far better reproduction of the otherwise problematic yellow colours and can then be decalled with Hurst or similar decals. Yellow precision cut vinyl coach sides for repainting a Mark IId TSO/TFO as Network Rail track recording coach 977986. Converted from a 4-REP motor car this vehicle is used for ultrasonic analysis and was commonly found between the Network Rail class 101 tractor cars. This kit is designed to complement the Hurst Models 101 tractor conversion kit. It contains etches to convert a Graham Farish by Bachmann Mark 1 coach (63' old style, not the 'Blue Ribband' version) into 999602. The kit contains coach sides, underframe edges and roof detailing. For best results suitable bogie sideframe castings are available from Taylor Precision Models. You will also need fine grille etching if you want to build the roof with full detail. We recommend Scalelink grille etches for the fineness. Etched overlay body sides for an ex-BG barrier coach with all windows plated. Fits the Bachmann Farish BG. Etched overlay body sides for an ex-BG barrier coach with all windows plated except for one door. Fits the Bachmann Farish BG. Network rail ex BG generator coach. Conversion sides to fit the Bachmann Farish Mark 1 BG. Etched overlay sides for ex-BG Generator coach 6312. To fit Bachmann Farish BG. Etched overlay sides for ex-BG Generator coach 6311 and 6313. To fit Bachmann Farish BG. Conversion shown by Mercig Studios.